Car rental reward programs get a bad rap for being primitive compared to the much more sophisticated Airline and Hotel reward programs. While this is true for the most part, some of them like Hertz Gold Plus and National Emerald Club are actually pretty good. Check out this post for a comparison of various car rental reward programs. Aside from standard rewards that earn points or credits on completed rentals, which can be redeemed for free rental days, some rental car companies run promotions that can help you get there way faster. Here's a quick roundup of such currently ongoing promotions. 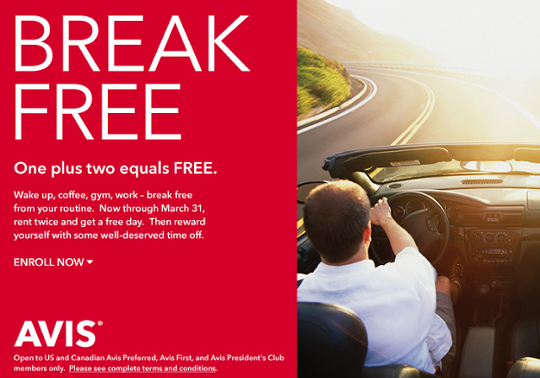 Avis Break Free promotion is available to Avis Preferred (signup for free here), Avis First and Avis President's Club members. Registered members earn a free rental day after completing two qualifying paid rentals through March 31, 2014. You need to register for this promotion before your rentals count towards this promotion. It is important to note that it'll be a long wait of 4-6 weeks before Rental Reward Day coupon arrives in the mail (yes, it's a paper coupon). The coupon applies only to a rental of Subcompact through Full-size or a Premium car. Don't forget to redeem the reward coupon before June 30, 2014. You can earn an unlimited amount of Break Free Rental Reward Day coupons during the Promotion Period and use upto four Free Rental Reward Day coupons for the same rental. Update (8/21/2014): This promotion is back and is now available through Jan 31, 2015. National One Two Free is available to National's Emerald Club members (signup for free here) and like the Avis Break Free promotion, it offers members a free rental day reward with every two qualifying rentals through Jan 31, 2014. Emerald Club members normally earn 1 credit for each completed rental of upto 4 days (and 2 credits for rental of 5-8 days) and can redeem 7 rental credits (6 for Emerald Club Executive members and 5 for Execute Elite members) for a free day certificate. This promotion gets you to a free day in a third of the time it normally takes to earn one. 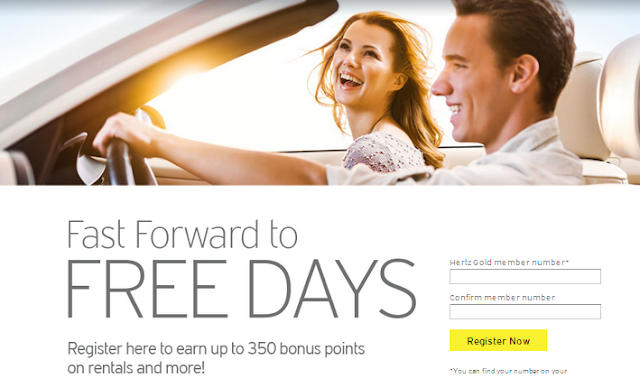 Once you earn the 600 points required for a Free Day coupon, you'll receive the reward coupon within 48 hours which is way better than the 4-6 weeks with Avis Break Free. However, while Avis allows you to use upto four Free Day coupons for a single rental, National caps it a three. Don't forget to use the reward coupons before they expire on June 17, 2014. Hertz Free Days promotion is available to Hertz Gold Plus members (signup for free here) and registered members can earn upto 350 bonus points (in addition to regular reward points) for each rental of two days or more through Dec 15, 2013. You need to register for this promotion before your rentals count towards this bonus. It is important to note that neighborhood rentals earn 250 bonus points, while airport rentals earn an additional bonus of 100 points bringing the total to 350 points. In addition, members earn 50 points just for registering and another 50 points for completing a quick three question survey. If you're not a Gold Plus member and are signing up today, please note that you'll need to wait for 48 hours before you can register for this promotion. Gold Plus reward points can be redeemed for a free weekend rental day for as low as 550 points, which you can easily earn by completing two paid rentals.